I think this week is dragging because I am so ready to be on vacation. The weather has also been unbelievably gorgeous. I sit facing a huge window at work so I definitely know when I am missing out on the sunshine. 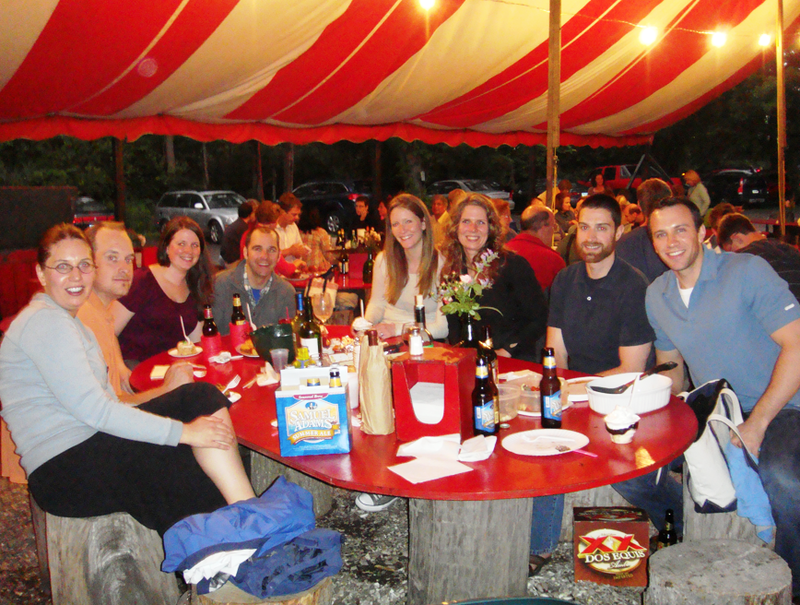 When I think of the 4th of July, I think of sunshine and picnics. I guess this would be a perfect world scenario. 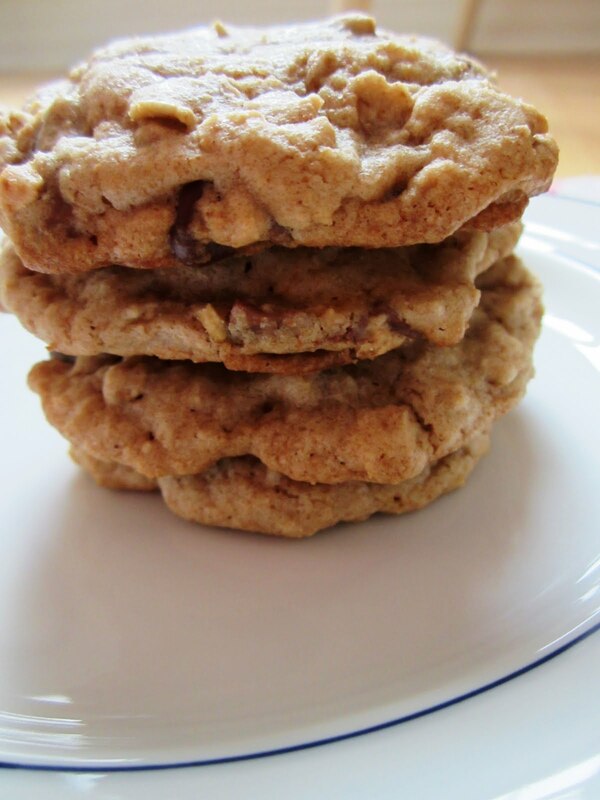 I also think that the most perfect, classic picnic dessert is cookies. But as we all know I have a very fond spot in my heart for cookies, so this may be a biased opinion. To prepare for the upcoming 4th weekend I had to create some fantastic cookies. These pretty much hit the spot right on. They are soft and chewy, a hint of chocolate and a bit of peanut butter. Yep, a little bit of 4th of July heaven. Preheat oven 325°. Line two cookie sheets with parchment paper. Whisk dry ingredients together in a medium bowl; set aside. With electric mixer mix butter and sugars until thoroughly combined. Beat in egg, yolk, and vanilla until combined. Add dry ingredients and beat at low-speed just until combined. Stir in peanut butter cups. Bake for 12 minutes spinning cookie sheets half way through cooking time. Leave cookies on baking sheet for 10 minutes before removing. Cookies will be a light golden brown and centers are still soft. Yesterday I woke up early to do Barre 3 workout video. I think of this as more weights and still planned to go to the gym after work. But after work I was beat and there was no way I was getting myself to the gym. I had planned an amazing dinner from Mama Pea of Potato and White Bean Basil Burgers. They look yum! Then all of our potatoes were rotten. It was beyond gross! I think it might have been Mr. J thinking up ways to sideline my vegan meal for the week. Recipe to come tomorrow! I wish every night could end like this. Do you ever think you have the best recipe ever? If you think you have a really good recipe this month submit it to June's YBR. 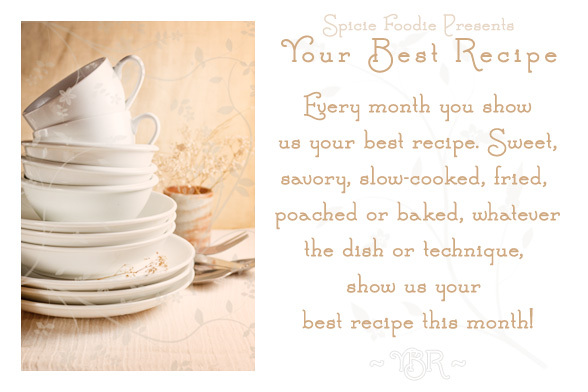 Nancy @ SpicieFoodie kindly collects every one's wonderful recipes to share each month. It may just be fresh in my mind but these blueberry banana yogurt muffins were my best creation. I was on the baking train this weekend and had a blast playing in the kitchen. It has been a long time since I have made muffins. ﻿With all the lovely berries out in the stores, I realized I had a fridge full of fruit to be used. It pains me a bit to add my favorite berries to baked goods. I think they are best just plain. I can easily finish off a container in one sitting. 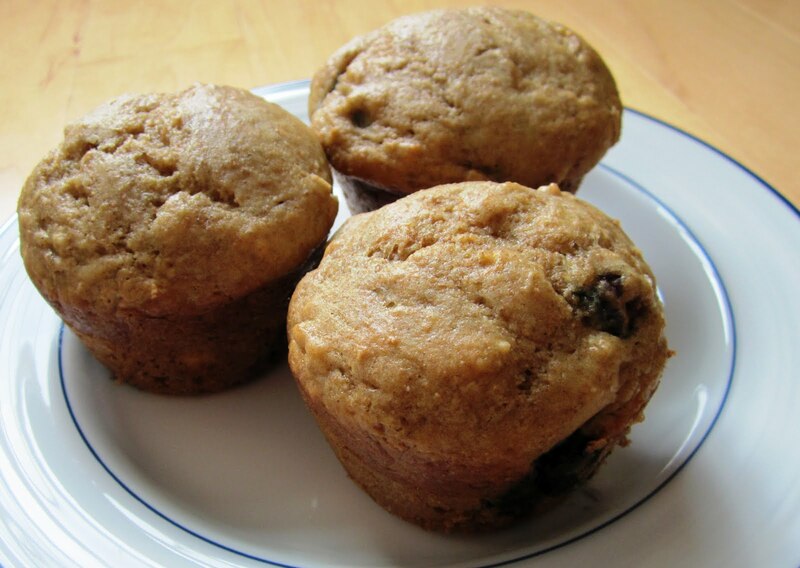 However, I do like fruit in bake goods and a favorite is blueberry muffins. * You can use Vanilla or Plain yogurt. I reduced the sugar amount to 1/4 cup from 1/2 cup when using flavored since the yogurt itself is so sweet. In a medium bowl, combine the flours, sugar, and baking soda. Then add blueberries. Stir in mashed banana until it just comes together. Be careful not to crush the blueberries. Set aside. In a large bowl, whisk together the eggs, yogurt, butter and vanilla. Gradually stir dry ingredients into wet. Divide batter evenly in a 12-cup muffin tin that has been greased. I now have another reason for not liking the rain. Our clamming adventures stopped before we even made it out the door. See, clams filter water and when it rains they filter rain water. Rain water is not very clean - gross huh? When it rains too much the Clam Association closes all of the clam areas because they are not safe to eat. Well, last week there was a lot of rain and thus when we called the clam hot line (don't laugh, it is very helpful) they said all areas are closed. Instead I got this done. ﻿Wtih extra time on my hand I was able to make carrot and celery sticks for easy snacking, prep cucumbers for salads, and dice strawberries for breakfast. All in all this probably took me maybe an extra 30 minutes. I am hoping it will save me some serious time this week, especially in the mornings when I need it the most. If nothing else I won't be washing the same cutting board every day. We had quite the selection of dishes to pick from. 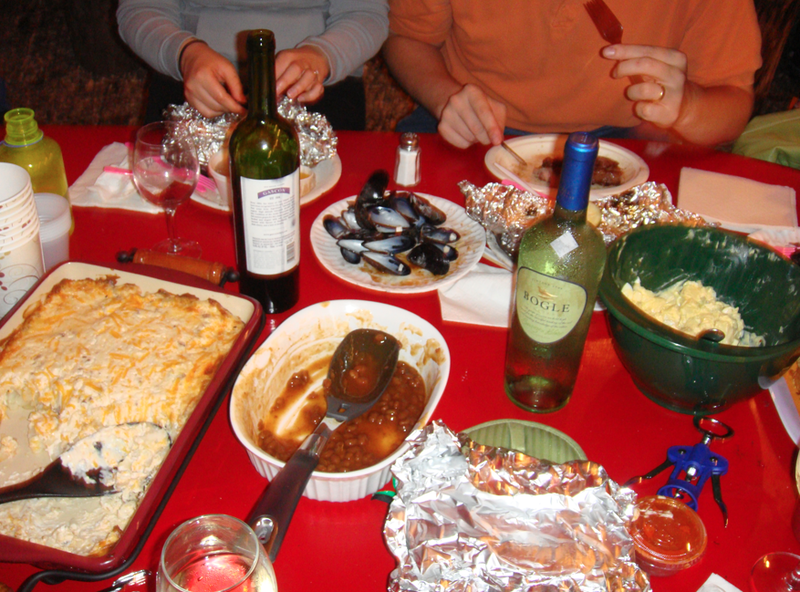 I am pretty sure everyone was full from just our own dishes. My favorite item ever at The Place is the roasted corn. It is so good. I could probably order 5 and call it a night. I was lucky enough to not be caught in a picture eating. Kari has her own blog and was more than willing to be photographed. They smother the corn in butter so it gets to be quite messy! Clearly they were a hit! Everyone had a fun night. On a side note, this is a restaurant Martha Stewart frequents but no one believed me. I did a bit of research and found the last time she visited here. I got a hole-in-one, but then Mr. J got a hole-in one on the same green. ﻿He completely stole my thunder and made my victory dance not as enjoyable. In the end he won by one shot. We were both really over par. I think the holes were a bit messed up though. 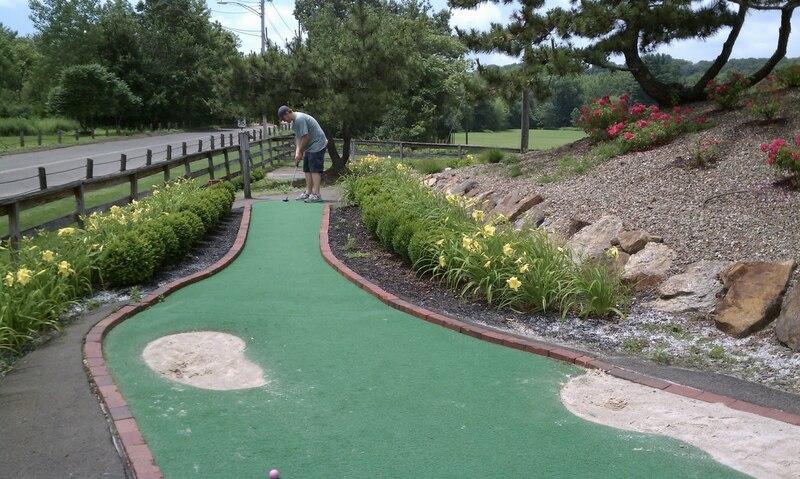 I cannot tell you how many balls jumped out of the holes. Up next today is a clamming adventure. We are hoping to catch our own supper. This weekend would have been like a mini vacation if it weren't for the laundry, dishes, and vacuuming that needed to get done. You know it is going to be a good day when breakfast consists of the most perfect smoothie ever. I don't know why I never thought of it before.﻿ Adding shredded coconut to a smoothie. Blend till smooth and top with granola. Yum! It was not too long ago that I didn't know what a Smart phone Application was...heck I only got a Smart phone beginning in 2011. Yep, till then I was perfectly content with a flip phone. Even that I didn't utilize to its full capacity. But now I have my hands on some modern technology and I am just starting to see the wonders of the Smart phone. I can only say that I will never, ever, be bored again! It is Hump Day today. Yesterday was one of those days that seemed to last forever and yet it went by so fast. My day started with an 8am meeting. It was a phone conference call. These calls are always inherently awkward. ﻿My co-worker were giving a presentation to a group of 13 people. I judge a conversation a lot by the body and facial expressions of the people I am speaking with. Over the phone you cannot do that. I could not tell if they were bored, interested, confused. So an hour later I was sitting there wondering was it good or bad? These pictures are just to prove﻿ that I do feed Mr. J red meat on occasion. We had flank steak on Sunday. I was pretty impressed with the results. I marinated the meat for 6 hours before throwing it under the broiler. Tonight is a "on your own" night. This means there are lots of random leftovers in the fridge. Not enough for a complete meal separately but if you take a little of each you would have quite the smorgousboard. The best part is that there is little preparation, the oven stays off, and the refridgerator gets cleaned. out. Today is the first day of summer. Can you believe it? A year ago I still lived in New York. A year ago I was still single, preparing for my wedding. Seriously, where does the time go? This weekend I had some incredible urgings to have chocolate and coconut. I mean, I am really hard pressed to think of a better food combination. They I got to thinking about my delicious dough balls that were not the brightest idea to try. I cannot get them out of my head. In a large bowl whisk together the flour, baking powder, salt, and oats. Add the nuts, coconut, and chocolate. In a separate smaller bowl use a whisk to combine the agave nectar and coconut oil. Add this to the flour mixture and stir until just combined. Eat a bit of the dough for quality control. Who put the guac in the guacamole?